Last year's winner Wishfull Thinking set off at a breakneck gallop under Richard Johnson and put in some spectacular leaps but heading down the back straight, the challengers were queueing up. Camping Ground fell at the fourth-last when just coming off the bridle, but Al Ferof and Ptit Zig cruised past Wishfull Thinking, whose run had come to an end with three furlongs to run. When Ptit Zig took a tired fall at the last, Al Ferof was well on top and the 9-4 chance came home a long way clear of Pepite Rose. Skelton said: "You can't say it was definitely over as Ptit Zig had already had a run. "All I did was get this lad as fit as I possibly could for today. "It's very nice of John (Hales, owner) to send him to me and it says volumes about the type of man Paul Nicholls is that he suggested he send him to me." Skelton went on: "I've done everything that I was told to do with him. Everyone knows he's got a good record fresh. I took him to Warwick racecourse for a gallop three weeks ago and that was probably the most important part of the jigsaw. "I'm absolutely delighted, it is as simple as that. I think John wants to go to the King George Chase but we'll see how he is in three weeks' time. "It's humbling to have such a good horse in the yard. 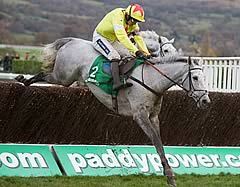 He jumped great and travelled great. "I knew that he's so good fresh, we had to take advantage. These things are just magic."